Recent debates about the role of close looking in art history have lamented its decline; the lure of the object replaced by that of the library and the digital image. Happily two exhibitions at the National Gallery suggest that close looking is still alive in art-historical research. ‘Making Colour’ and ‘Building the Picture: Architecture in Italian Renaissance Painting’ differ in scale and scope, but encourage visitors to deconstruct the use of colour and space in painting. ‘Making Colour’ circumnavigates the colour wheel, explaining how pigments have been produced and used over 500 years. The histories of particular pigments are explored in depth, with the trade route of lapis lazuli, the ceramic history of Naples yellow and the dye heritage of red lake receiving as much attention as particular artworks. This may be a research-led exhibition based on the work of the gallery’s Scientific Department – it daringly hangs Ercole de’ Roberti’s The Dead Christ backwards to show its purple velvet reverse and concludes with an interactive colour perception experiment – but by identifying how and why artists employed different pigments it really challenges visitors to look hard at the paintings, to interrogate and compare their colours. ‘Building the Picture’ does the same for space, bringing the background to the fore in a range of sacred and secular scenes. The development of perspective to create illusory space in the Renaissance is well known, but the exhibition, based on a research partnership with the University of York, directs attention to architecture’s compositional and cultural role. Far from being neutral scenery, palaces and arches, bell towers and loggias not only create places for narratives to unfold, but play with the spatial possibilities they construct, drawing viewers into, and excluding them from pictorial space. As such, refocusing the eye on backgrounds effectively highlights the mechanics of picture-making. Both exhibitions, which draw on the National Gallery’s permanent collection, with a few loans interspersed, cleverly combine star works with less familiar ones in mutually illuminating ways. 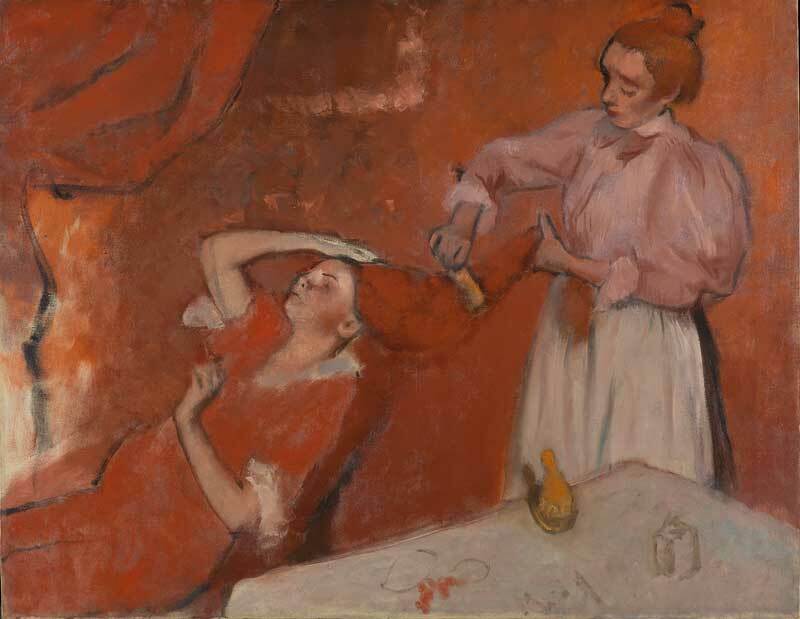 Degas’s Combing the Hair and Masaccio’s St Jerome and John the Baptist employ multiple red pigments to different ends five centuries apart. Different depictions of Solomon’s temple seem to push through the translucent figures in works by Sebastiano del Piombo and Lambert Sustris. These combinations encourage visual comparison unfettered by the works’ fame or perceived quality. Admittedly the looking that both exhibitions cultivate is not the ‘primary, immediate and responsive’ type Ben Street has recently advocated. Admiring the difference between a faded smalt and a still luminescent ultramarine or noting an impractical architectural space is advocated for its contextual and theoretical repercussions. For the visitor it is likely a result of, rather than an alternative to, reading the label text. However, the art history behind these exhibitions begins and ends with close looking, and they successfully embed a more attentive vision, a more curious eye. It is regrettable that visitors are encouraged to really get close to artworks at a time when the knowledge and experience of the gallery’s visitor services are potentially jeopardised by privatisation plans. With global politics so dominant in the conversation surrounding Manifesta, there was a danger the art might become an irrelevant sideshow. Does it hold its own?